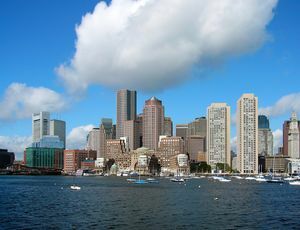 The Financial District in Boston, as the name suggests, is home to a number of banks, brokerages, and law firms. It is roughly bounded by Atlantic Avenue, State Street, and Devonshire Street. The core of the district has few tourist attractions, and becomes very quiet after business hours. However, the New England Aquarium is at the eastern edge of the neighborhood, and the Downtown Crossing shopping plaza is nearby in downtown. The neighborhood is served by Aquarium-Financial District (Blue Line), South Station (Red Line), and Downtown Crossing (Red and Orange Lines) stations. The Financial District is accessible via I-93 exit 20 (northbound) or exit 23 (southbound). New England Aquarium, Central Wharf (T: Aquarium), +1 617-973-5200 . M-F 9AM-5PM, Sa-Su 9AM-6PM. Home of what was until recently the world's largest fish tank, according to the Guiness Book of World Records. Great fun for kids of all ages. Whale watching tours available, too. Adults $20.95, Students $18.95, Senior 60+ $18.95, Ages 3-11 $12.95. Boston Hilton Financial District, 617-556-0006 . 4-star hotel in the center of the Financial District. Boston Furnished Apartments, 617-357-6900, Boston Furnished Apartments is a furnished apartment rental agency, offering an alternative to a hotel room. These rentals are private homes, condos or apartments located in residential buildings within the Back Bay, Beacon Hill, North End, South End, and Financial District neighborhoods. There are monthly, weekly and nightly rentals available. The homes range in size from smaller studios to one or two bedroom apartments, and all have fully equipped kitchens and private bathrooms. This is a unique way to experience the city like a Bostonian, in a brownstone home. Rental paperwork is required and most credit cards are accepted. This page was last edited on 29 November 2016, at 09:16.